The Invisiblised Struggle of an Ally: Who Will Take Notice of ORIC’s ‘Show Cause’ Letter to *KMYAC? This is an article about two stories that tell a little of the struggles of a group of native title holders who’ve become marginalised from the corporation their people were compelled to form in order to make a claim on their traditional lands and negotiate for the protection of important places, access to country, and a stake in the economic development of the region. What makes these two stories important is that they are all that exists in the mainstream, alternative, and environmental media in Australia. This is in spite of the fact that this struggle revolves around a controversial mining company and a very controversial proposed rail line that will ensure that the largest coal complex in the world can be opened up. Negotiations over land use agreements for the proposed rail line were held under the threat of compulsory acquisition and subject to the usual unequal and opaque processes that native title holders are made subject to under the Native Title Act. The bodies responsible for arbitrating and regulating Indigenous corporations play a part in my article. Much of the information I gathered from them was hard-won. I can’t say that either the arbitrator or the regulator prioritise information giving or have consistent practices/knowledge organisationally. They certainly are not geared up to support a blackfella marginalised from their Indigenous corporation. The ‘show clause’ letter mentioned in the title is the regulator’s third attempt at compelling the Indigenous corporation to cooperate and allow their dealings with the controversial mining company to be put under scrutiny. 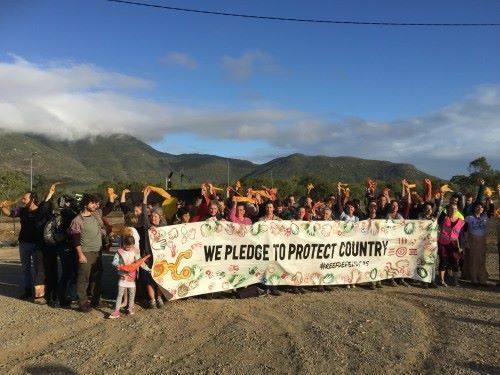 On October 20, 2014 the ABC published a story by Isobel Roe titled ‘Native title holders lodge objection to proposed North Galilee Basin rail project’. The Juru people are the traditional owners of land that Adani Mining is using to build the North Galilee Basin rail project. They said most of the traditional owners did not know what Adani’s plans were and were unable to attend information meetings, including a forum in Townsville. Chairwoman Carol Prior said they were lodging an objection with the Native Title Tribunal because they had not been properly consulted. In my conversation with an unnamed National Native Title Tribunal (NNTT) employee on May 23, 2017 I was able to gather information relating to Adani/NGBR ILUAs that for unknown reasons is not available on the NNTT website or anywhere else. I was told that following the second vote on the ILUA that is listed with the NNTT under tribunal number QI2014/072, a ‘notification’ period of one month starting Oct 21, 2014 was made available for to lodge objections to the ILUA. I was told by the NNTT employee that no objection was lodged. 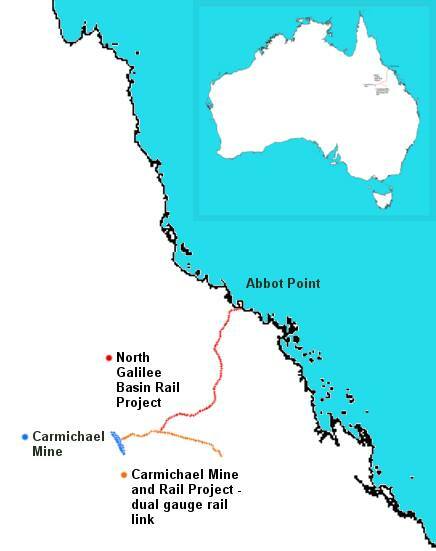 Not only was there no objection lodged by Carol Prior or her fellow native title holders, but no objections were lodged against any of the three ILUAs relating to the North Galilee Basin Rail Project (NGBR) that were voted on, lodged, and registered between August 2014 and April 2015. For background on the NNTT see my blog post titled ‘The National Native Title Tribunal: Arbiter or “record keeper”?’. On Oct 21, 2016 the Townsville Bulletin published a story by Samantha Healy titled ‘Calls for Aboriginal corporation to hand over its books’. The story outlines how Carol Prior and fellow KMYAC members have made a complaint to the regulator of Aboriginal corporations which involves allegations of mismanagement and “financial irregularities” relating to payments from Adani amounting to more than 2 million dollars. I first called ORIC on April 19, 2017 and was told that ORIC had received a report from the examiner and would publish something in “3 weeks”. I called ORIC again on May 1 and confirmed that “May 10ish” was the date when something would be published. On May 15 I called ORIC again and spoke to a case manager who read sections of what I’ve now come to discover was the draft report from the first examiner appointed in September 2016. A senior ORIC media officer would not confirm the voracity of any of the quotes I took from my conversation with the case manager. I cover this phone call in my blog post titled ‘ORIC to redo examination into Indigenous corporation involved in negotiations with Adani’. The case manager explained to me that because the first examination “wasn’t completed properly” due in part to instances when the examiner was “unable to access the [Indigenous] corporation” and unable to access “other” parties. The case manager also revealed “we had issues obtaining information”. I put some questions to the senior ORIC media officer via email and was able to confirm that an incomplete draft examination report was submitted to ORIC on March 6, 2017. On 6 March 2017 Mr James Barrett lodged with ORIC a draft examination report which was incomplete. A final examination report was never lodged with ORIC. Between March 6 and May 10 ORIC decided that they would need to appoint a new examiner and when they posted the new Notice of Examination they removed the previous notice. The senior media officer would not explain why the the old notice was removed. In June, 2017 I had an in depth conversation with Dr James Swansson, author of a research paper prepared for ORIC called ‘Analysing key characteristics in Indigenous corporate failure’. Dr Swansson indicated that the data he used was at least 10 years old and the research paper itself was published in 2010. The research paper outlines the types of corporate failure and the role of ORIC in regulating and responding to various circumstances that Indigenous corporations may encounter. I explained the context of the examinations into KMYAC to Dr Swansson and was advised that KMYAC would likely fail to cooperate with the second examiner. This is precisely what the release by ORIC on August 25, 2017 of a ‘show cause’ letter threatening “special administration” demonstrates has happened. ORIC are exercising their powers under the CATSI ACT in response to repeated refusal by KMYAC to cooperate with the appointed examiner. I am writing to tell you that I am considering putting the Kyburra Munda Yalga Aboriginal Corporation RNTBC (ICN 7581) (the corporation) under special administration under Division 487 of the Corporations (Aboriginal and Torres Strait Islander) Act 2006 (CATSI Act). An Aboriginal corporation charged with negotiating an ILUA with Adani over a rail corridor that is widely reported to be the rail corridor earmarked for a I billion loan from the Northern Australia Infrastructure Facility (NAIF) is alleged to have received upwards of 2 million dollars from Adani in 2014/15 without disclosing those funds in published financial statements. This Aboriginal corporation has failed to cooperate with two examiners, the first a solo operator, and the second a large firm with offices in Townsville. Carol Prior has carried her message of voting irregularities and mismanagement of negotiating processes over a crucial ILUA from her Oct 2014 interview to her Oct 2016 ORIC complaint. In the intervening period she has been involved in media and events associated with various conservation organisations and environmental NGOs. They’ve mentioned her name and spoken of how they want to protect her country, they asked her to sign their open letters and attend their events, they call her “Aunty” but they’ve never share any of what you just read. No spokesperson, journalist, activist, or blogger has ever published anything outside of the two largely ignored stories I just shared with you.